Managing Director and founder of Disability Responsiveness New Zealand, Pam MacNeill, hails from Christchurch, where she began her State Sector career in Care and Protection Social Work and Community Work. Pam was the national Manager of the Mainstream Employment Programme at the State Services Commission in Wellington for sixteen years. She spent some time at both the office of the Health and Disability Commissioner, as Disability Programme Developer and at the Capital and Coast District Health Board, where she developed the role of Disability Responsiveness Educator. producing reports ultimately destined for the United Nations, for the Convention Coalition Monitoring Group. After successfully completing a two-year contract as Quality Improvement Lead within Disability Support Services at the Ministry of Health, Pam relaunched her consultancy as: Disability Responsiveness New Zealand in May of 2016 and registered DRNZ Ltd as a company in 2017. 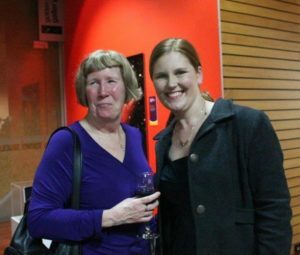 Pam with Upper Hutt City Councillor Ros Connelly at the Launch of the Enhancing Accessibility resource, at Expressions Arts and Entertainment Centre. The handbook and training guide, along with a series of workshops, were developed by DRNZ for the Upper Hutt City Council in June 2017.